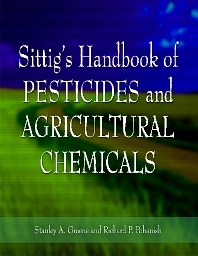 Sittig's Handbook of Pesticides and Agricultural Chemicals is specifically designed for use by those engaged in the agricultural and food processing industries, both vital to our nation's health and economy. People in every phase of food production, from the farm to the fork, will find a wealth of material here. It will also be of interest to professionals in the pharmaceutical, cosmetics, and personal care industries who use agricultural products as ingredients. It provides crop, chemical, regulatory, health and safety information on nearly 800 pesticides, fertilizers, and other agricultural chemicals. These chemicals are organized withg unique identifiers so that all who may have contact with or interest in them can find critical information quickly. Food technologists, agricultural extension agents, agricultural chemical handlers, chemists, technicians, educators, manufacturers and regulators on state and federal level, government agroterrorism agencies and industry vendors/suppliers, professionals and educators across the entire food chain starting with pesticide manufacturers to food scientists, and animal/plant inspection services. Will also be of interest to pharmaceutical and cosmetics/personal care chemists, engineers and formulators, newspapers and the legal community.